The Solar Battery Charger is a charger for Ni-Cad batteries with a built-in solar panel. The lid tilts up to face the sun. Holds 4 "AA" batteries. Take this product anywhere! Will work for NiCad batteries also. ***Free Shipping offer is only valid for purchases being shipped via ground, within the continental US. All orders being returned, refused, or mis-orders by the customer, will be charged a shipping fee. When credit is issued to the customer the cost of shipping will be deducted from the credit amount. Shipping charges will apply to special orders, specialty items and wholesale orders. One major crisis facing us all today is that our many landfills continue to build up huge amounts of toxins from vast quantities of disposable batteries as well as from old NiCad (Nickel-Cadmium) rechargeable cells. Fortunate for Earth, all of her many creatures & her vegetation are the newer, higher capacity NiMH (Nickel-Metal Hydride) batteries. Not only do NiMH cells store 3 to 4 times or more energy than the older-technology NiCads, they are essentially non-toxic! They also are rechargeable up to 1000 times & suffer no cell memory problems like NiCad cells do. 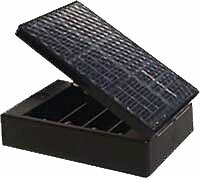 Enter the small solar battery charger such as the B101 available from CETSolar.com. Using only energy from direct Sunlight & then converting it, this inexpensive little solar battery charger will effectively recharge your NiMH AA batteries from nothing more than the abundant, free power coming from our little star/Sun. Though originally designed for NiCad batteries, the B101 will also do a fine job recharging NiMH cells. Just be aware that it will take a lot more time to fully recharge these higher-capacity batteries, so the old tried & true adage of �Patience is a virtue� is important to keep in mind here. In direct Sunlight the B101 can fully charge 4 older 700 mAh (milliamp hour) NiCads in about 28 hours of direct Sunlight while the unit is generating about 100mA of current (100 milliamps). Newer NiMH AA batteries store 2500 mAh or more of energy so they will take much longer to fully recharge. An example equation: 4 discharged batteries of 2500 mAh storage capacity (totaling 10,000 mAh of energy) divided by 100 mA current each hour = 100 hours� or about 12 days of 8-9 hours per day in full-Sunlight charging. The charger contains a blocking diode so one can leave the batteries in the unit after it gets dark without the stored energy draining from them. One single AA battery at a time may be recharged in the B101, or just 2 or 3 as needed. Hence, the recharging calculations will alter & are faster. For instance, if only one 2500 mAh AA is being recharged then all 100 mA of energy is directed into this lone cell, fully recharging it in about 25 hours of direct Sunshine. If 2 AA cells are charging then the current is divided equally between each cell, or 50 mA of current each, 50 hours. When 3 AA cells are charging then the charging current becomes about 33 mA each for 75 hours &, as already discussed, charging 4 batteries together will send 25 mA of current to each cell each hour in full, direct Sunlight, 100 hours. Keep in mind that an economical charger like the B101 is in no way weather-resistant. It should not be left outdoors when a chance of rain or snow exists. Take care not to mar the plastic coating protecting the solar panel, as the energy producing capability can fast become compromised. While the unit will charge from behind windows at home & in vehicles, the charging will be at a slightly reduced rate as ultraviolet light (readily available from direct & indirect Sunshine) is a factor in the strongest possible conversion from Sunlight into electrical current & not much UV makes it through most glass. Having several sets of rechargeable batteries available will aid your success in battery recharging from a small solar charger. Once one begins to realize the many benefits from using the free energy available from solar charging then it�s easy to become enthusiastic over doing something much more sustainable than throwing away massive amounts of toxic, disposable batteries every year. Getting into the routine may take some personal adjustments for many of us, though the benefits greatly outweigh the detriments. Saving a lot of money, easing-up on toxic waste production & investing in our future are but a few of the reasons to recharge NiMH batteries using plentiful Sun power. It�s also quite contagious! Sharing good things with family & friends is pretty easy too & even feels good. Best wishes to you towards increasing responsibility & greener Earth, as her future is one & the same as our own. * Distinctive differences that readers will find on this page are references to as well as the capitalization of Sun & Earth, which are not commonly found so in our languages & societies today� & why not? We capitalize Venus & Mars along with the rest of our solar system�s planets, yet most of us have come to write �the earth� instead of �Earth� & �the sun� in place of �Sun�. Is this a subtle indication of how little reverence we have for the planet that we were first given stewardship over? Can this be an indication of a lack of respect for the center of our solar system that would cease living were it not for Sun�s life-sustaining warmth & energy? Consequently, both Sun & Earth are aptly capitalized on this page. Web site is updated daily.